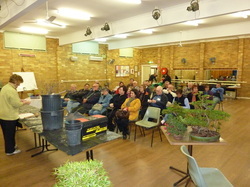 Illawarra Bonsai Society Inc meets on the 3rd Monday of each month from February to November. In December, the club holds its Annual General Meeting and Christmas Party on the 2nd Monday. There are no meetings in January. The schedule of upcoming meetings can be found at the club meeting schedule. Visitors are more than welcome to attend.